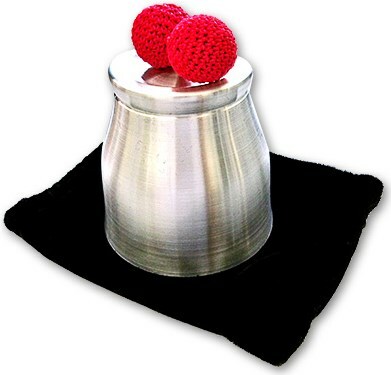 Placing the red ball on the table beside the empty aluminum cup, you pick up the red ball in one hand and the cup in the other hand. Show both to the audience. You drop the ball into the cup and let everyone see it go in the cup. Turn the cup down onto the table and ask the audience where the ball is. They say "under the cup," and you say "no" as you the lift the cup straight up to show there is no ball under it. "Here it is," you say, taking the red ball from your pocket. After showing the audience this red ball, you put it back in your pocket and ask the audience again where the ball is. Whatever they say, you lift up the cup and show that the red ball is now underneath the cup. Comes with bag, chop cup, and one regular red ball, and one "chopped" red ball.